The High Street links Maidstone to the River Medway and runs through the very heart of the town. The High Street regeneration project has created a more pedestrian-friendly environment and reduced the impact of vehicles, while still allowing for buses. The project, a £3.1 million investment by us and Kent County Council, was completed in two phases in 2012 and 2013. It has helped attract new business to the town, with many new shops and businesses opening in previously vacant units. Independent research has suggested that our investment will help generate £4.5 million of additional expenditure in the town as well as creating nearly 100 new jobs. Granite paving is used throughout the scheme, which incorporates a banding pattern reflective of the historic grain of the street, recalling the original burgage plots, and echoing the former lives and uses of this historic route into Maidstone. 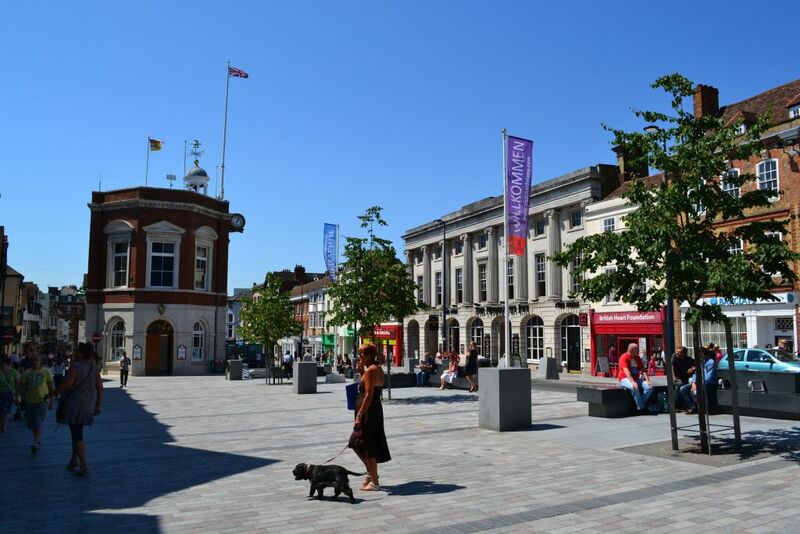 Two new pedestrian areas have been created, Remembrance Square in the Lower High Street and Jubilee Square, outside the Town Hall, in the Upper High Street. Both areas provide attractive year round spaces in which people can sit and relax. Jubilee square is a focal point for the town, hosting regular markets and small-scale, live music events. The project was designed by Letts Wheeler Architects who won an international design competition led by the Royal Institute of British Architects in 2009. The scheme on the ground was delivered by our partners Eurovia who helped in the Upper High Street and Conway who helped in Lower High Street. Cycles and Taxis: They can access the High Street from King Street and Pudding Lane. Buses: They can access the High Street from King Street, Pudding Lane, Mill Street and Fairmeadow. Blue Badge Holders and Loading Vehicles: They can access the High Street from Pudding Lane only. There is a loading bay at the bottom end of the High Street near to Barclays Bank. Users should note that the top end of the bay is also a bus stop. There is a limited waiting bay at the bottom end of the High Street opposite Barclays Bank. Vehicles can park in the bay for 10 minutes. The taxi rank is outside Lush on the corner of the High Street and Gabriels Hill. There is a second rank on King Street. Information about taxi ranks around the town can be found on our Taxi Licensing pages. We try to keep the High Street as clean as possible. More about what we do can be found on our Street Cleaning page. The square is available to hire. Email jubileesquare@maidstone.gov.uk for more information. Some of your events may need a licence. More information about licences can be found on our licensing pages.